These machines offer the best possible image in an instant – with minimal radiation. Digital Radiography offers even greater tools within the computers. Images can be manipulated so that our doctors can make the most accurate diagnosis. Original images are easily stored on computers and copied to CD’s in moments if second opinions are needed. 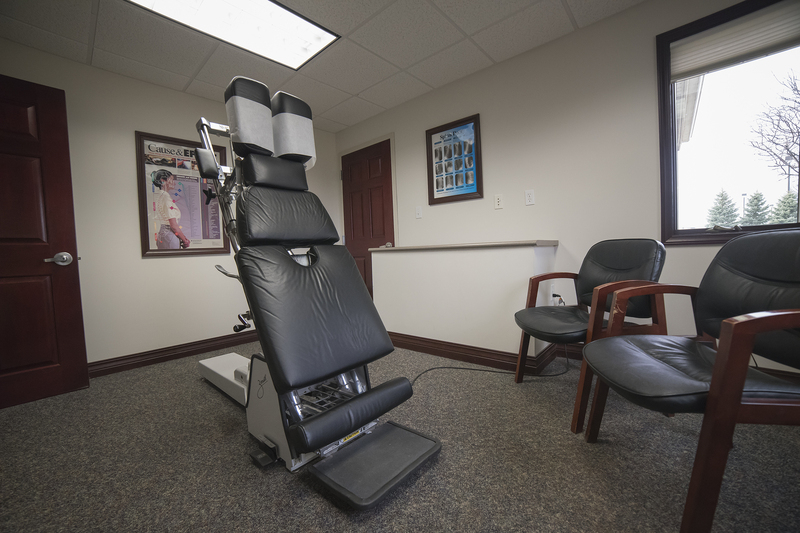 Great Lakes Chiropractic is the home of several therapy tables. Intersegmental Traction, Long Axis Traction, and Flexion/Distraction. These tables are a useful tool for the appropriate condition and can sometimes make a difference in the successful treatment while under the supervision of our doctors and staff. conditions. They can drop, separate, move, and slide so that our doctors can use different techniques for different condition including pregnant women. Each one is located in its own private room. Our waiting area has an amazing 400+ gallon saltwater reef aquarium with an abundance of seating. The kids area has a custom painted underwater scene with two kids play tables. Even though we have a great waiting area, we strive to see every patient within 10 minutes of your scheduled appointment.